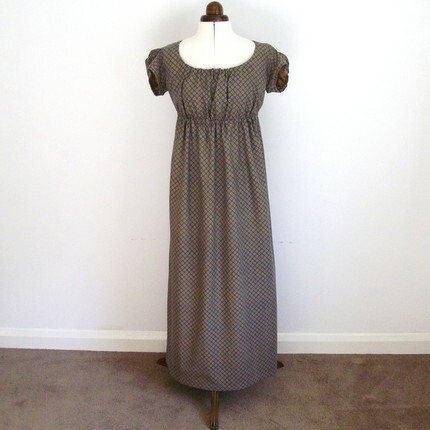 After much discussion with V.B., my modiste, we decided that I would order this dress in a cream sprigged muslin. It is period correct and shows a high attention to detail and craftsmanship. Plus, Historika is making my chemise and petticoat so it made sense to have her do them all. Sadly, Historika emailed me to let me know that, despite it’s popularity in the Regency, she couldn’t find sprigged muslin of any sort, much less cream. What she could find was a lovely French cream muslin and a white Swiss lawn. I’m going to stop for a moment and talk about fabrics. When the Regency talks about muslin what they mean is a lighter-weight fabric than our quilting muslins. This was softer and had more flow and drape like a voile or a batiste or even a lawn. Lawn, which was very popular is like… think of a very fine vintage handkerchief or a christening gown. It’s extremely fine cotton that is quite sheer. A Swiss lawn is one that has, basically, embroidered dots on it and was fairly popular. Historika offered to either put some tambour embroidery on the sleeves and bodice of the cream French muslin or to dye the Swiss lawn. In the end I decided to go with the plain white Swiss lawn, because white was the most “correct” choice and I really wanted the texture on the fabric. It will also be more flexible if I want to add accessories. There are other fabrics out there, which are close analogies to the right material but Historika lives in a small seaside town in the UK and her options were limited. I went to our local fabric store (for other reasons), which is HUGE and has a very knowledgeable wholesale department. While there, I posed the sprigged linen conundrum. They found several things which could pass for sprigged muslin in the “fancy cotton” category. Voilles, batistes and even something labeled as an eyelet had a fine enough weave and pattern to pass. The Robert Kaufman fabrics, in particular had several good matches. I’m very happy with the Swiss lawn approach, but in case this comes up for someone else, I thought it might be helpful. Fabric and dress decided, I then went back to V.B. who is creating either a spencer or a sleeveless pelisse for the dress. We are still waffling a bit. The reason that I’m having two different people work on the ensemble is that a spencer needs to be fitted and is quite tailored. The dress I’m having made uses drawstrings and while it will be made to my measurements doesn’t need to be as quite exact in fit. I’ll post next about the spencer or pelisse. Lavender’s Green Historic Clothing also does lovely work!